This cue ball is just what you need to replace the pitted, worn-out one you have been using for far too long. The cue ball is the first one to go, since it takes the biggest beating. The quality of this ball (A grade) is probably much higher than that which came with your table. If your pool table features a ball return, then you will need to get either an oversize cue ball or magnetic cue ball instead, depending on the return mechanism your pool table utilizes. The ball measures 2-1/4" in diameter, which is the standard billiard ball size. It weighs 5.9 ounces, which is regulation weight. 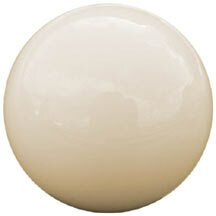 BCA pool ball specifications require pocket billiard balls to be 2-1/4" in diameter and between 5.5 and 6.0 ounces. Sterling Deluxe House Cue, 42"